JT Holmes has base jumped 3,000 feet off the top of a hot air balloon. JT Holmes has legitimately flown from Chicago’s Sears Tower. 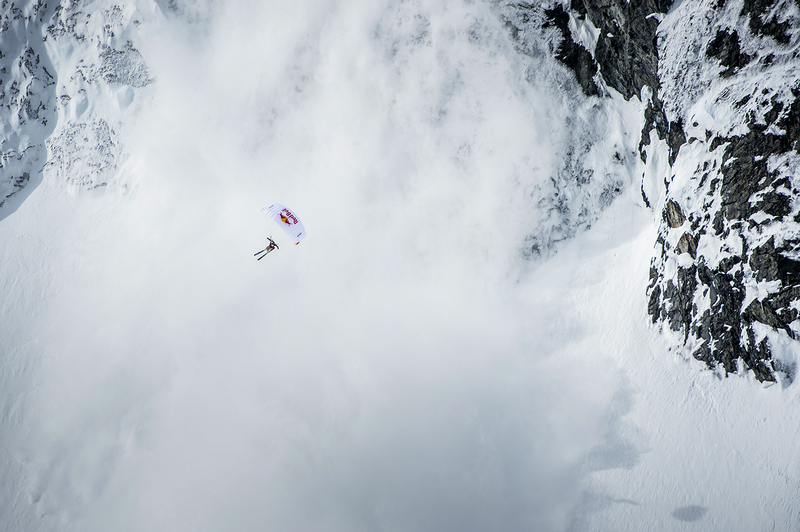 JT Holmes has skied off the side of a cliff in the Swiss Alps, released his skis mid-air, and proceeded to parachute the rest of the way to the ground. 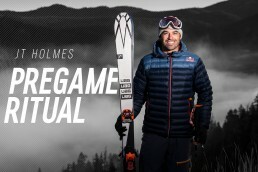 But on this particular day, JT Holmes is on his way to Salt Lake City for what I presumed to be another stunt so crazy that video-game developers lack the mental capacity to even dream it up. Okay, so maybe not the sort of activity I had in mind. But if there’s one person out there qualified to motivate and inspire you and your desk-ridden office mates, surely it’s the guy who was literally buried alive by an avalanche? I think everyone has seen a movie or played a video game and thought to themselves, “Imagine if it was actually possible to do that in real life.” But then you can go on YouTube and search “JT Holmes” and there you are, actually doing these things most people can only imagine. So I guess my question there is, where does the desire and drive to basically do the impossible come from? The drive is for good, clean fun. The most exciting fun tends to be with these new sports and developing in it. To have all that energy of a sport that is redefining itself every year. Whether that’s through pieces of gear that are being developed and making new things possible or just simply further exploration of areas and simply raising the bar. Do you ever feel like a video game character come to life? As far as the video game metaphor, there are two sports that I participate in that really do have that quality. 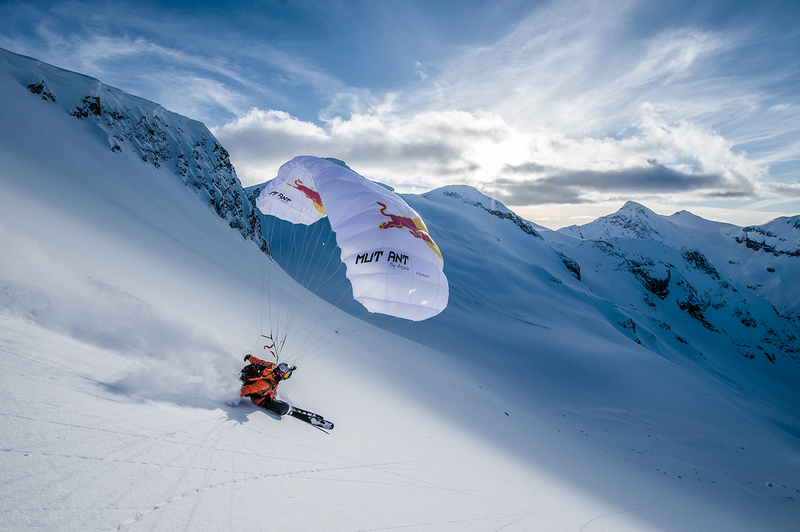 One of them is speedriding—that’s where we ski with an open parachute. You have obstacles that are typically very hazardous and inhibiting and they suddenly just become an area that you fly over with your parachute. Then you can resume skiing. The second one is wingsuit flying, which is simple and intuitive. It’s a really good time. Yeah, it’s definitely scary and it’s definitely quite dangerous. But it’s also very easy. The barrier to entry is not that significant and modern-day wingsuits are very simple to use. Most airborne sports—skydiving or anything with gravity in the air—there’s not really a strength component or even a balance component. It’s all very simple and intuitive as long as you keep a level head. It’s about being prepared for when things go wrong that helps you to excel. You’re no stranger to things going wrong. About two years ago you were buried in an avalanche while skiing in Lake Tahoe. 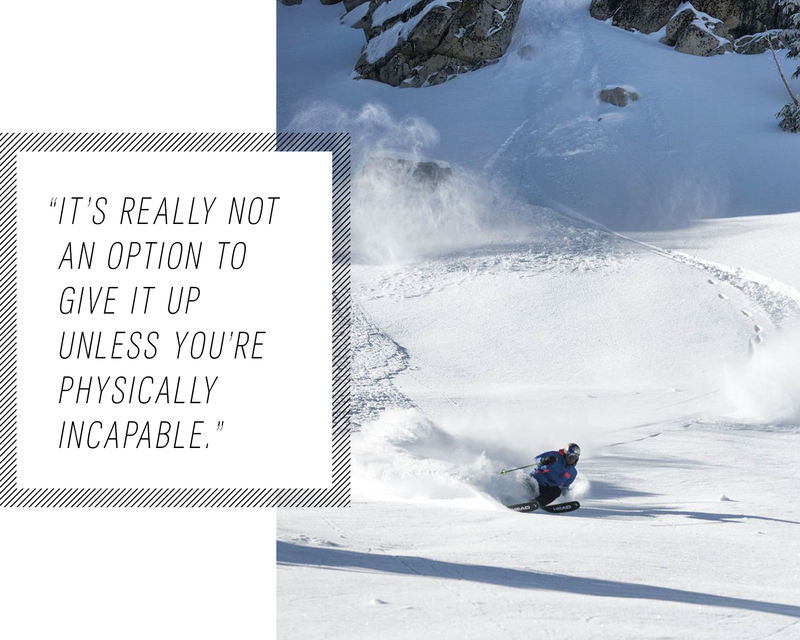 How difficult was it for you to get the motivation and desire to hop back on a pair of skis and trek up a mountain after an accident like that? I don’t even know if I should really classify it as an accident. Any time you nearly die, it should be an accident, right? I took one day off from skiing and then went right back up. I didn’t have any issues going back into the backcountry. For people who have been skiing their whole lives, it’s just something that’s ingrained in your being. It’s what you do socially, it’s what you do recreationally, and, for me, it’s what I do professionally. It’s really not an option to give it up unless you’re physically incapable. Skiing is really a part of me and when bad things happen, you analyze all the decision making that went into getting yourself in that position, both good and bad. You take note of those, learn from them, and carry on as a more experienced mountain man or mountain woman. I’m sure it’s something that’s ingrained into your mind very early on when you start skiing that it’s a very real possibility you will one day experience an avalanche, which I’m guessing helps come back from something as scary as what you experienced. Exactly. Anyone who is an avid backcountry skier, they will have an experience with an avalanche. That will happen. That experience might be triggering one but not getting caught in it. It may be outrunning one. It might be witnessing one. It could be participating in a rescue. I’ve had experiences with avalanches over the last 20-plus years of backcountry skiing and that just happened to be the one that managed to bury me. When you’re seconds away from a jump, what is going through your mind? I’m not thinking about life and death. I’m not thinking about doing it right or how it’s going to feel. I’m really just focused on my checklists. Once the checklist is good to go, I’m good to go. You use your cognitive brain all the way up until that moment. Once the cameras are ready and you hear, “Go,” you’re really shifting into another way of thinking. I believe that’s when you’re using your emotional side of your brain. You’re going to be reacting rather than having thoughts and planning. Do you still get nervous before any of these stunts? Oh, yeah! Totally scared! Barely slept the night before, cottonmouth, shaky hands, the whole deal. Have you learned anything over the years to help you better combat those nerves? I do have certain pre-game rituals. I try to slow my breathing, slow my heart rate. Positive self-talk. You know, “You got this! You got this all day! This is going to be fun!” I always try to bring myself back to the mindset of, “You’ve worked really hard for this, so this is going to be fun.” You want to get yourself in a mindset where you’re actually happy to be there rather than terrified and wishing you were somewhere more safe. I also like to have a green apple. [Laughs] I was definitely not expecting you to follow that up with “Have a green apple.” Explain that to me. You don’t have to wash it down with water. It helps solve your cottonmouth situation. It’s tart. That tartness kind of serves as a little wake-up. I’ve found that I can find a little bit of courage in a green apple. Recently you’ve been at the helm of some pretty amazing stunt work for these massive blockbuster movies. What is harder to prepare for, something out in the wild or these complex movie stunts? Nothing was more challenging than the Eiger, to be honest. There were so many components that had to come together. It required a tremendous amount of dedication. However, we were a lean crew. A few cameramen, two helicopters, and two performers. With major motion pictures, often the amount of people is in the hundreds. Everything there is just a larger scale as far as red tape, you might say. You know, shutting down city blocks, getting permits. You have to do everything by the books. To bring an action sequence to fruition is complicated in a way that there is a lot more behind the scenes work.You’re at a desk putting pieces of the puzzle together. Whereas with something like the Eiger, I was in the backcountry familiarizing myself with equipment. There were many, many outdoor hours which were inherently rewarding as an outdoor enthusiast. What’s the most nervous you’ve ever been before taking on a certain challenge? Either standing on the Eiger or standing on top of the Sears Tower for our very first base jump in [a movie] sequence. After more than half a year of planning and rehearsing, to have the team up there and 200 people on the ground involved with the production, there was just a tremendous amount of pressure there. Plus, you’re standing on top of a 1,400-foot skyscraper looking down. Yeah, you get a little nervous. But you’re also really confident. Fear is a tremendously effective motivator. You understand that you’ve set a lofty goal so you know you’re going to be scared. Even the thought of carrying out the goal triggers some fear within your body and mind. You train as hard as you can possibly train and you prioritize your preparation above many other things, so it’s really kind of an unusual tool. Fear puts you on your A-game. Even if you’re not hitting the slopes (or parachuting off of buildings), check out some of our favorite loungewear, tough denim, and off-duty fits that can handle anything thrown your way.